On the eve of the Furniture Fair, a certain buzz can be felt around Milan. As it does every year, the city is preparing to welcome some 400,000 visitors to the 57th edition of its trade fair dedicated to design and furniture, which runs from Tuesday, April 17 to Sunday, 22. Over the years, the fair has also become an unmissable date in the calendar for a number of fashion houses, which have begun participating with an increasingly diverse range of events. More than 1,300 exhibitors will participate in both the official fair, which will take place at the Fieramilano Rho-Pero, where some 300,000 visitors from 165 countries are expected, and the "Fuorisalone", a parallel programme featuring a range of almost 1,000 fringe activities, including a number of presentations and other creative initiatives, taking place in no less than 14 of the city's neighbourhoods. The unique event attracts countless tourists ever year, just one of the reasons that certain fashion brands have been gradually increasing their investments in the Salone del Mobile, and particularly in the Fuorisalone. Beyond presenting their home lines, a growing number of labels have begun organising a wide range of events during the dynamic week-long fair, hoping to stand out from the crowd with diverse marketing strategies. Some brands launch capsule collections or collaborations with big names in design, while others organise parties, exhibitions or happenings. The National Chamber of Italian Fashion (CNMI) has also been running its own "Milano Moda Design" programme for a few years now. 2018's calendar features 37 brands, 50 events and 11 presentations of home collections. The programme is an opportunity to rediscover those maestros of Italian fashion who have turned furniture into a real business, such as Armani Casa, Etro Home, Roberto Cavalli, Brunello Cucinelli, Diesel, Bottega Veneta, Missoni Home, Versace Home or, indeed, Fendi Casa, which will celebrate its thirtieth anniversary this year with a grand party. There's no lack of Parisian fashion houses either, as Louis Vuitton has again chosen the Milan Furniture Fair as the moment to present the new pieces in its "Objets nomades" collection of travel-inspired objects, as well as a new line entitled "les Petits Nomades", at the Palazzo Bocconi, on the Corso Venezia. Hermès will also be present, operating in no less than five different locations in the Lombard capital. Elsewhere, Cartier promises to dazzle visitors with a special installation erected around the Arco della Pace to celebrate its Santos watch. A number of other brands will participate with special projects, including Max Mara, which is unveiling a new limited-edition pair of sunglasses. Called "Lavaprism", the glasses feature a geometric design and were created in collaboration with the German painter Kerstin Brätsch and the United Brothers collective. Valentino's boutique will display a selection of objects from famous Milanese gallery Nilufar, owned by collector Nina Yashar, while Ermenegildo Zegna will present its new range of leather accessories, Zegna Toyz. Other highlights include the inauguration of Fondazione Prada's Koolhaas tower, a former distillery dating back to the 1910s which has been transformed by architect Rem Koolhaas to become the venue for "an accessible and constantly evolving programme of cultural events". A final noteworthy event comes in the shape of the launch of Simone Guidarelli's Walldesign project. 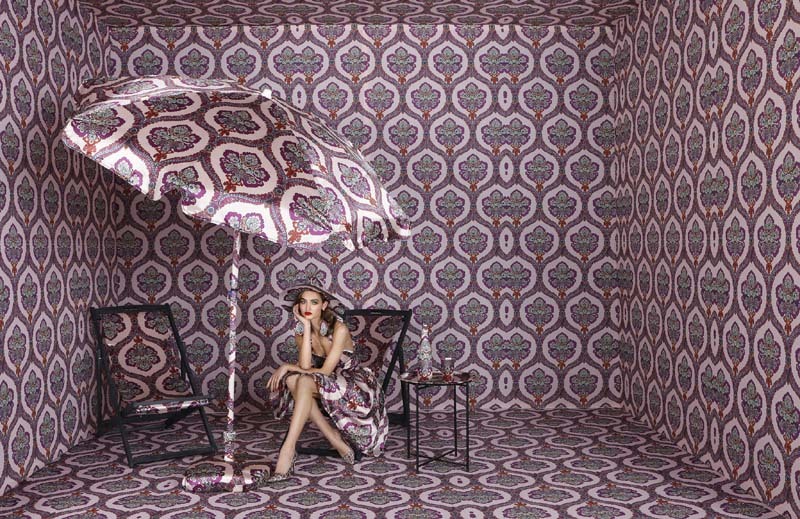 The Italian fashion designer is launching a collection of original upholstery fabrics inspired by patterns from old textile designs from the Fondo Renzo Brandone. The project has already caught the attention of K-Way, with whom Simone Guidarelli has developed a capsule collection of windbreakers.